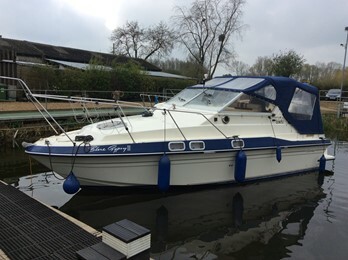 Fairline Sunfury 26, "Blue Gypsy II"
Fairline Sunfury 26, "Moody Blues"
These were the first range of the true sports cruisers developed by Fairline. Bernard Olesinski started the modern era with his designs which still are used today. This deep V planing hull craft is designed with performance in mind. The original 26 has 4 conventional cabined berths. The Sunfury has a rear cabin arrangement with large cockpit. 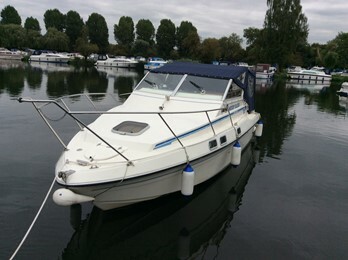 This heralded the design ethos of large sociable cockpits for warm sunny use often found in Europe. All models were outdriven. Powered usually by Volvo petrol/diesel engines.